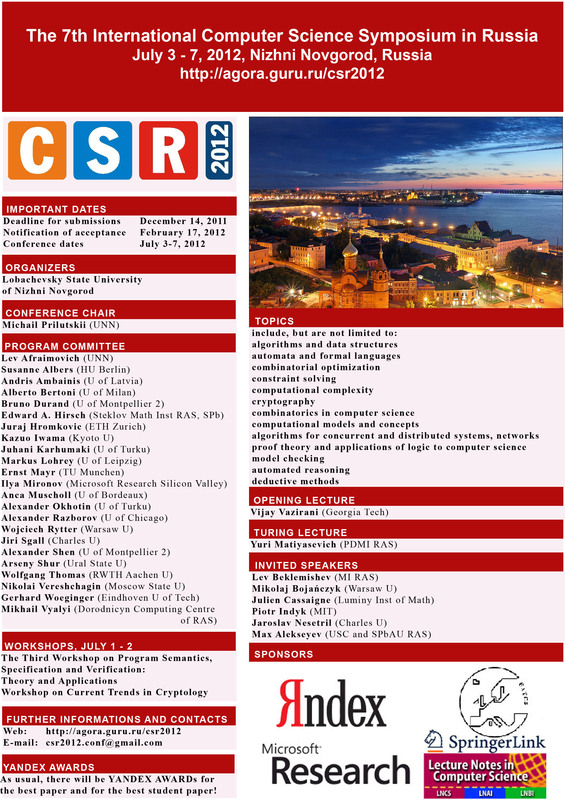 CSR 2012 intends to reflect the broad scope of international cooperation in computer science. It is the seventh conference in a series of regular events previously held in St.Petersburg (2006), Ekaterinburg (2007), Moscow (2008), Novosibirsk (2009), Kazan (2010), and St.Petersburg (2011). The proceedings are published in Springer LNCS. Nizhny Novgorod was founded by Prince Yuri (George) Vsevolodovich in 1221 on the confluence of two great Russian rivers, Volga and Oka. It is a large city accessible by multiple international airlines including regular Lufthansa flights from Frankfurt. Authors are invited to submit an extended abstract or a full paper of at most 12 pages in the LNCS format (LaTeX, as pdf; final version with source), in English; instructions can be found at http://www.springer.com/computer/lncs?SGWID=0-164-7-72376-0. Proofs and other material omitted due to space constraints are to be put into a clearly marked appendix to be read at discretion of the referees. Papers must present original (and not previously published) research. Simultaneous submission to journals or to other conferences with published proceedings is not allowed. The proceedings of the symposium will be published in Springer's LNCS series. Accepted papers MUST be presented at the symposium. for the best paper and for the best student paper will be given by the PC. SPECIAL ISSUE of the journal Theory of Computing Systems will be published by Springer as usual. Authors of papers selected by the PC for the issue will be invited to submit, and the papers will be refereed according to standard rules of ToCS.